The above three brands together offer a staggering total of almost one hundred floorplans of pontoon boats between sixteen and twenty-five feet including some models with an upper deck. The Sweetwater Premium 195 C (Cruise) is one of twenty-seven Premium models ranging from nineteen feet to twenty-five feet. 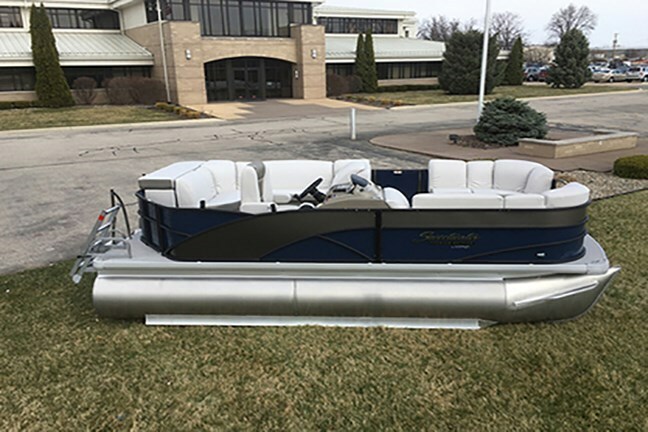 The standard features of the Premium 195 C provide you with all the basic necessities of a pontoon boat of this size but the fun will be your ticking off items and features from the unusually long and comprehensive optional equipment list so that you can create a distinctive boat unique to your personal desires. Outboard power is available from your choice of BRP, Honda, Mercury, Suzuki, and Yamaha from 25 through 75 horsepower depending of course on your intended cruising and watersports activities. You may want to consider performance upgrades which add hydraulic steering, a middle 25-inch tube or provide three 27-inch tubes along with various lifting strakes, larger fuel tanks, underdeck skins, skirting, keel strips, etc. available in packages or as individual options. Ahead of the driver’s helm console which is centred on the starboard side is a three-seater lounge with wraps around the bow corner to the centre bow entry gate. Opposite this on the port side is a two-seater lounge extending aft to the port entry gate. Aft of this gate is a large L-shaped lounge extending aft and across the stern to the starboard side stern entry gate. This lounge offers an aft sunpad with storage. Soft Touch vinyl upholstery covering choices are Ivory, Caramel, or Slate. The very complete helm with windscreen includes a speedometer, tachometer, voltmeter, fuel and trim gauges, hour meter, and a 12-volt power outlet ahead of the tilt steering wheel and swivel reclining captain’s chair with slider and fold-down armrests. The centre of this helm is reserved for the optional Hook 3X depth/fishfinder graph or Simrad GO5 XSE touchscreen fishfinder/chartplotter. Digital gauges and a GPS speedometer are optionally available. Storage is provided within this helm for the optional 25-quart carry-on cooler. Other standard features include a bimini top in seven colour choices of canvas, a playpen cover, Mica Mist Plaid carpet throughout, LED docking lights, stern boarding ladder, table with built-in cupholders, courtesy lighting, an App.-ready Bluetooth compatible stereo with auxiliary and USB ports plus four speakers. Then choose black or silver rails and from seven choices of rail skin colours plus optional graphics if you so choose. Floor covering options for the entire deck or for each of the bow, mid-ship, or stern portions of the deck are numerous including many choices of colour and texture of vinyl, carpet, and faux-wood including Versa-Teak. Snap-in carpet over vinyl is also available. Wicker-wrapped seat bases are available as an upgrade to the standard vinyl. Canvas upgrades include vinyl seat covers, woven acrylic electric Power Toon bimini, or a full cabana enclosure with screens. For the helm console, choose a height adjustable helm chair pedestal with or without the elevated helm platform covered with your previous selection of floor covering. A unique option for the Premium 195 C are stern port and starboard extended deck platforms integrated into the deck structure which also replaces the standard aluminum boarding ladder with a stainless steel one. You may also add a portside boarding ladder to really enhance your watersports fun. You could then add a basic or deluxe ski tow bar, or the Turbo Swing XL ski tow bar. Inside, you may want to choose an extra table, under seat mood accent lighting, various moveable cupholder units, change room with or without a porta-potti, bow entry gate filler seat, bow cooler table, bow cooler ottoman, plus an in-floor storage compartment if you have previously selected the third centre tube. The aerated livewell option is great for both fishing and cruising use. Upgrade your stereo with a stern remote control and/or an upgraded Polk Turn It Up II stereo with Sirius satellite radio. Even though less than twenty feet, the Sweetwater Premium 195 C is a lot of pontoon boat.